At 1 pm, flecks of snow began to drift down from the sky above Mt. Greylock – uncertain and flaky at first, then a steady drizzle. Such leaves as were still present on the trees collected the snow, grew heavy and their branches bent double under the weight. 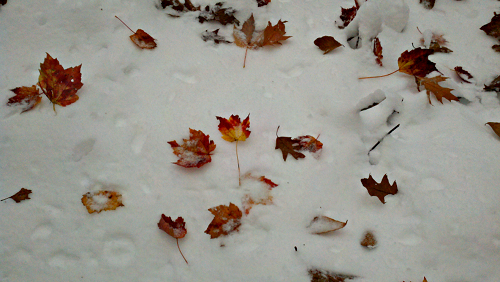 The color of autumn began to fade from the ground; ephemeral fires before the long whiteness. On the summit, kind caretakers closed down the doors of Bascom lodge for the winter and took the treacherous paved road down the mountain. One pianist and one flautist made their way down the western slope to the town of Lanesborough. At the same time, two novice backpackers took the northern route on the Appalachian trail before bearing west, keeping their eyes peeled for weathered white and blue paint on a few tree trunks that signalled the vanishing trail. Soon, the afternoon grew dim, thunder punctuated the steadily humming snowfall, and tracks of man, woman, bear and coyote disappeared. In an hour or so, no evidence would remain that a half-dozen people took different paths down the slopes of Mt. Greylock on the afternoon of the great Noreaster. Earlier than most years, Winter claimed the Berkshires for its own. Thank you, Stefanie. Hope you had a good Thanksgiving !